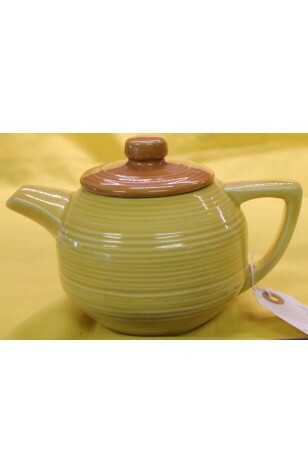 Vintage - McCoy Pottery, USA Pattern #649, Yellow Tea Pot w/Light Brown Lid, Circa 1950's. Retro Modern Tea Pot, Pattern #649 by McCoy Pottery. This is a Mid-Century Yellow Tea Pot, with Cream Rings encircling the Pot, and topped by a Light Brown Lid. This is a Cute Single Serving Tea Pot which measures 3 1/2" Tall. It is in Great Condition... and made in the Good Old U.S. of A.!! Retro Modern Tea Pot, Pattern #649 by McCoy Pottery. This is a Mid-Century Yellow Tea Pot, with Cream Rings encircling the Pot, and topped by a Light Brown Lid. This is a Cute Single Serving Tea Pot which measures 3 1/2" Tall. It is in Very Good Resale Condition unless noted below or in pictures... and made in the Good Old U.S. of A...! !